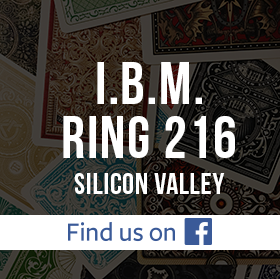 A surprise announcement opened the March 13, 2019, meeting of Ring 216. President David Martinez presented the Wally Gibson Outstanding Contributor Award to Cal Tong for his many years of service to the Ring. Thank you, Cal! Steve Silverman, longtime creator and performer of elegant magic, is based in Los Angeles but has close associations with our magic community. Tonight he treated the Ring to a lecture covering some of his favorite effects. The first half of the lecture highlighted his core single-coin routine, with its dazzling series of odd happenings. This was followed by one of Steve’s favorites for many years, his version of Vernon’s Silk and Silver: three coins wrapped in a handkerchief vanish and return. During the explanations each move and subtlety was detailed with clarity as the members followed along with their own coins. The second half was devoted to Steve’s working repertoire of card routines. In the “Santa Anita Opener,” a the back of a chosen card changes color, the the deck changes color. The “$20 Switch” is a crafty maneuver that turns red aces to black aces in a flash. “A Moment of Egress” provides a clever handling to the classic routine of a selected card vanishing from a packet and reappearing face up in the deck. And this was just the beginning of a series of impromptu card effects, culminating in a repeat card to pocket. It was a great night of immersion into a world of thoughtful creation. We appreciate Steve’s sharing his work with us. Join us on March 13 at 7:30 p.m. sharp for a magic lecture by Magic Castle magician and friend-of-Ring 216 Steve Silverman. As a gift for Ring 216 members, Steve's lecture is free for paid members ($20 for non-members). You can sign up for membership at the meeting and enjoy all the benefits for just $25. Steve Silverman has been an underground magic aficionado for many years and has finally agreed to come out and share his ideas with the magic community with this lecture. Steve’s ideas and effects have been featured and credited in works by Jon Racherbaumer, Jim Swain, Martin Nash, J.K. Hartman, Dean Dill, John Lovick (Handsome Jack), and Stephen Hobbs, amongst others. His effects are published in MAGIC Magazine, Labyrinth, Infinity Power, Switch, and others. He is a long-time member and featured performer at The World Famous Magic Castle in Hollywood, and has performed at Trade Shows from Las Vegas to New Orleans to New York, and has been dubbed “Coin Magic Superman” in Genii Magazine. Steve’s lecture is based on his two favorite items, coins and cards. The coin portion of his lecture is not about “coin tricks” per se, but a full deconstruction and insight into Steve’s routine that put him on the map. He will perform and walk through his Silver Dollar manipulation routine and break it down, explaining not only the how’s, but also the why’s, walking us through the basic moves and structuring of the routine while tipping a few of his own twists-and-turns in coin magic. But that’s just getting us started! The second portion of the lecture will feature some of the card routines and effects featured in the above- mentioned books and in his Magic Castle act. DVDs and lecture notes will be available for purchase. All attendees are highly encouraged to bring your own silver dollar (or equivalent) coin piece, as this is a very interactive and fun lecture. You don’t want to miss out! Trophies and certificates were awarded for the magic competitions at the start of the February 13, 2019 meeting of Ring 216. In the Walkaround competition, first place went to Dan Chan and the People’s Choice was Luke Adams. In the Close-Up competition, the standard division winners were Miriam al-Sultan (first place) and Tetra (People’s Choice), and the masters division awards were given to Perry Yan for first place and Luke Adams for People’s Choice. In the Stage competition, Susan Zeller took the standard division first place and Mitch Kothe the People’s Choice, while in the Master’s division, both awards went to Tom Collett. Open performances followed with the audience divided into groups, so that the entertainers could try out their routines several times and garner feedback on each. John Jay caused an ace and three jokers to transform. Alan Leeds demonstrated his astonishing trip to the donut shop. David Martinez caused a quarter to vanish several times and finally appear in a surprising place. Rafael Delgadillo showed how with one hand he can cause all the cards to face one way except the spectator’s selection. Tom Collett printed four cards from blanks followed by a magical transposition of the cards. Mitch Kothe divined a spectator’s cell phone password. John Mosch and Phil Ackerly rounded out the night.